A Bangladesh military official says 20 hostages, all foreigners, have been killed during a siege in the capital, Dhaka, where security forces stormed a restaurant and killed six gunmen holding the hostages. "We've recovered 20 bodies. Most them had been brutally hacked to death with sharp weapons," Brigadier General Nayeem Ashfaq Chowdhury told reporters on July 2 in Dhaka, without giving the nationality of the victims. Thirteen survivors were also rescued at the end of the siege in an upmarket neighborhood of Dhaka, including three foreigners. 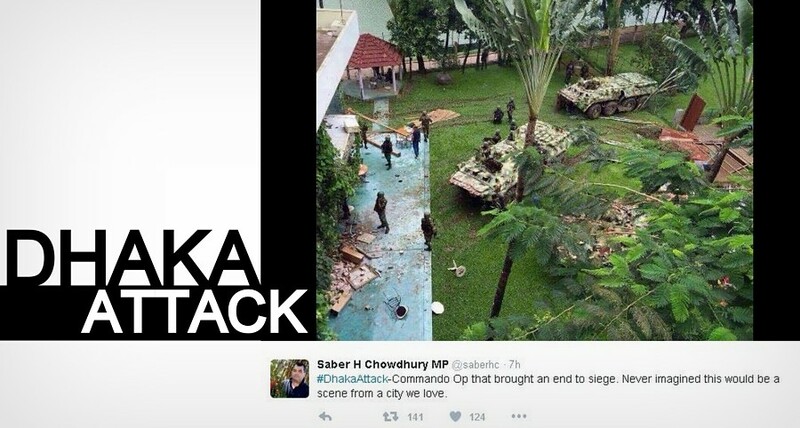 "Three of those who were rescued were foreigners, including one Japanese and two Sri Lankans," said the spokesman.As many as 100 police commandos backed by seven armored vehicles stormed the restaurant in Dhaka's diplomatic quarter. Police said that during the raid early on July 2 they also shot and killed six of the gunmen, who had shouted "God is great!" in Arabic as they began the assault. The dramatic raid and rescue followed a 10-hour standoff between police and the heavily armed gunmen, during which police unsuccessfully attempted to negotiate the release of the hostages. At the end of the raid, two big explosions could be heard coming from inside the restaurant. The Islamic State extremist group has claimed responsibility for the attack and said it killed 24 people, posting photos of what it said were victims on the web. The Bangladeshi authorities had earlier dismissed such claims. Police and witnesses said the gunmen attacked the Holey Artisan restaurant in Gulshan, a diplomatic district of Dhaka, around 9 p.m. local time on July 1. The assailants, believed to be carrying assault rifles and grenades, exchanged sporadic gun fire with police outside for several hours after the attack. Italy's ambassador to Bangladesh, Mario Palma, told Italian state TV that seven Italians were among the hostages. "It is a suicide attack. They want to carry out a powerful and bloody operation and there is no room for negotiation," Palma said. The hostage crisis marks an escalation from a recent spate of murders claimed by IS and Al-Qaeda targeting liberals, gays, foreigners, and religious minorities in Bangladesh. Bangladesh has seen a spike in militant violence in the last 18 months. Attacks have tended to be against individuals, often using machetes. The raid on the restaurant was a rare instance of a more coordinated operation. Earlier on July 1, a Hindu priest was hacked to death at a temple in Jhinaidah district, 188 miles southwest of Dhaka. Both IS and Al-Qaeda have claimed responsibility for many of the killings, although local authorities say there are no operational links between Bangladeshi militants and international extremist networks. Bangladesh security officials say two local militant groups, Ansar-al-Islam and Jamaat-ul-Mujahideen, are behind the violence. Ansar pledges allegiance to Al-Qaeda, while Jamaat-ul-Mujahideen claims it represents IS.